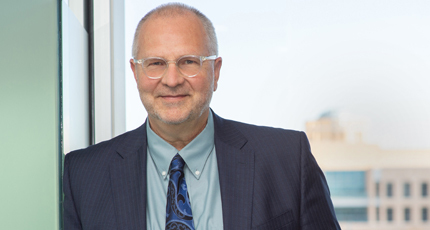 Stuart Butzier has assisted mining, energy, high-tech, industrial and ranching clients throughout his thirty year legal career with Modrall Sperling. His counsel has included helping clients strategically navigate the maze of environmental and mining regulatory and permitting regimes, the morass of litigation, and the unique challenges of complex deals and real property transactions involving private, Federal, State, Indian and split-estate lands. 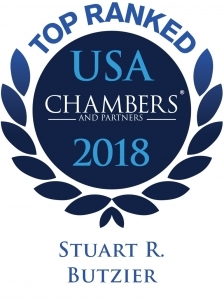 Recognized in the area of Environment, Natural Resources & Regulated Industries by Chambers USA, “Stuart Butzier is a standout name in the mining space, and is held in very high regard by clients and peers alike.” One client describes him as “highly professional and very much a guiding light,” while another notes that “he has a very clear understanding of the law and is a good strategist.” Stuart was named by the Natural Resources, Energy and Environmental Law (NREEL) Section of the State Bar of New Mexico as the 2018 NREEL Lawyer of the Year. The award is given to a single attorney each year for “demonstrating professionalism and integrity, superior legal service, exemplary service to the NREEL Section, and service to the public.” Best Lawyers® has named him as “Lawyer of the Year” seven times in Albuquerque or Santa Fe for Environmental, Mining or Natural Resources Law. He has achieved the AV® rating from Martindale-Hubbell and has been selected among those included in Southwest Super Lawyers®. 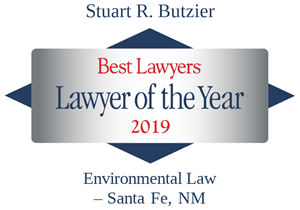 Stuart currently is the firm’s elected Vice President, Head of the Natural Resources Department, and Managing Director of the Santa Fe office. He is serving a third term as a member of the firm’s Executive Committee. Stuart has devoted himself to ensuring that the firm’s attorneys and staff are primed to provide excellent, cost-effective service to clients. Stuart is a team player who is adept at helping clients and colleagues pursue their business and professional goals. He also helped to recruit many of the firm’s bright and diverse young attorneys. Stuart is actively involved in community and professional non-profit organizations. He has served as the Secretary and a Trustee of the Rocky Mountain Mineral Law Foundation, and as the past Chair of the Section of Natural Resources of the State Bar of New Mexico. Stuart is a current officer of the Mining Law Committee of the International Bar Association’s Section on Energy, Environment, Natural Resources and Infrastructure Law (SEERIL), and he has contributed countless hours as program chair, author and speaker in connection with legal education programs and publications in New Mexico, throughout the West and internationally. In 2019 Stuart was appointed by the New Mexico Supreme Court to serve on its Proactive Regulation of Attorneys Committee. Stuart’s civic involvement includes serving as President of New Mexico KidsMatter, a nonprofit group of volunteers serving as court-appointed special advocates for abused and neglected children, and as President of the New Mexico School for the Blind and Visually Impaired Foundation. He enjoys playing guitar in an active band and supporting the music scene in New Mexico. His other interests, apart from his family, include basketball (as a former college player and youth coach), natural landscaping, amateur photography and art. Represented BHP Billiton, Rio Grande Resources, Freeport McMoRan Copper & Gold, New Mexico Copper, Peabody Energy, Burrell Resources Group, BE Resources, Alta Gold, Newmont Mining, and Copper One, among others, in permitting proceedings and hearings before the New Mexico Mining & Minerals Division, the Mining Commission, the Environment Department, and the Water Quality Control Commission. Represented Los Alamos National Security, LLC in ground water discharge permitting proceedings before the New Mexico Environment Department. Represented various mining, real estate and IP companies in complex commercial litigation matters involving claims ranging from breach of contract to fraud and civil conspiracy. Advised numerous clients on mining claims, staking and notice requirements on federal public lands or split estate lands under the General Mining Law of 1872 and the Stock Raising Homestead Act of 1916. Represented Anglo Pacific and Resource Capital Funds, respectively, in connection with mines and mining interest due diligence involving lead and uranium operations and facilities in Michigan and New Mexico. Litigated in U.S. District Court for the District of New Mexico on behalf of Goldcorp and its Mexican mining subsidiary, Minera Peñasquito, in connection with a failed transaction to purchase over four million dollars’ worth of large mine equipment tires. The case resulted in judgments being entered in favor of Minera Peñasquito against defendants. See Minera Peñasquito S.A. de C.V. v. Shannon, et al., U.S. Dist. Ct. No. CIV 09-1149 BB/WDS (D. NM). Lead litigator for Mainline Rock & Ballast in suit over complex mining transaction involving rights to royalties and related payments associated with development and production from a quarry on split-estate lands. Case resolved through a mediated settlement. See Conway v. Mainline Rock and Ballast, Inc. and EUCON Corp., Seventh Judicial District Ct. (NM) No. D-0722-CV-2006-00174. Represented various clients in pre-litigation and litigation under the Comprehensive Environmental Response, Compensation and Liability Act (CERCLA, or Superfund). Represented multiple clients’ interests in various adjudicatory and rulemaking proceedings before the New Mexico Mining Commission and Coal Mining Commission, including cases arising from permitting and enforcement contexts and multiple proposed rulemakings under the New Mexico Mining Act of 1993 since the Act’s inception. Represented BHP Billiton and its subsidiaries, BHP Navajo Coal Company and San Juan Coal Company, in enforcement proceedings and settlements with the federal Office of Surface Mining (OSM) and New Mexico Coal Bureau under the requirements of the Surface Mining Control and Reclamation Act (SMCRA). Counsel to Santa Fe Pacific Gold Corporation in litigation against United Nuclear Corporation over reclamation requirements for the Northeast Church Rock Mine. Case resulted in a settlement that led to performance of reclamation responsibilities by United Nuclear Corporation’s parent, General Electric. See Santa Fe Pacific Gold Corp. v. United Nuclear Corp., Eleventh Judicial Dist. Ct. (NM) Civil Action No. CIV 97-139-II. Co-Counsel to Freeport McMoRan Copper & Gold in appeals from the so-called “Copper Rule” establishing predictable requirements and permitting conditions to protect ground water under the New Mexico Water Quality Act, resulting in a favorable outcome in the New Mexico Supreme Court. See Gila Resources Information Project v. NM Water Quality Control Commission, Nos. S-1-SC-35279, -35289 & -35290 slip op. (N.M.S.Ct. March 8, 2018). Represented BNSF Railroad in complex, multi-party negotiations over environmental, indemnity, voluntary remediation and liability involving a legacy train fueling station site in an urban setting with diesel and other constituents present in ground water. Co-Counsel to Phelps Dodge Corporation and its successor, Freeport McMoRan Copper & Gold, in adjudicatory proceedings and appeals before the New Mexico Environment Department, the Water Quality Control Commission, and the New Mexico Court of Appeals involving closure requirements for the Tyrone and Chino open pit copper mines under the Water Quality Act. See Phelps Dodge Tyrone, Inc. v. N.M. Water Quality Control Commission, 2006-NMCA-115, 140 N.M. 464, 143 P.3d 502. Served as co-counsel to Newmont (USA) Limited, along with Colorado counsel, in connection with reclamation requirements under the Mining Act and CERCLA Section 104(e) inquiries from the U.S. Environmental Protection Agency (EPA) relating to uranium sites in New Mexico leased to other mining companies by Santa Fe Pacific Gold Corporation and Santa Fe Pacific Mining. Counsel to Peabody Natural Resources Company and its subsidiary, Lee Ranch Coal Company, on issues under the Clean Water Act (CWA) and the Archeological Resources Protection Act (ARPA), including lead counsel in Triennial Review and other proceedings before the Water Quality Control Commission (WQCC) involving the application of water quality standards to mine impoundments. Co-Counsel to Freeport McMoRan Copper & Gold in connection with proceedings under the Migratory Bird Treaty Act (MBTA). Litigated in the U.S. District Court for the District of Colorado on behalf of a mining contractor on claims of liability under CERCLA involving the gold heap leach operation that became the Summitville Mine Superfund site in southern Colorado. The client gained dismissal after favorable rulings on motions to dismiss and for summary judgment. See United States v. Robert M. Friedland, et al., United States District Court for the District of Colorado, Civil Action No. 96-N-1213. Represented golf course club in connection with backup water supply issues and New Mexico Water Quality Act ground water discharge permitting proceedings associated with the club’s secondary use of fully treated wastewater placed into ponds and withdrawn for irrigating the golf course facilities. Counsel to SunZia Transmission in connection with State and private lands rights-of-way and related matters. Lead New Mexico counsel for Invenergy LLC and its subsidiaries, La Sierrita Wind and SolarGen, in connection with county wind ordinance hearings, land transactional advice, and state court litigation. Presented health and noise experts in a San Miguel County Commission proceeding in the course of successfully advocating for reasonable setback requirements for commercial scale wind turbines. Lead counsel for Vawtpower, Inc., in New Mexico Public Regulatory Commission (PRC) proceedings relating to efforts to address and promote distributed generation sources in the state. Provided advice and drafting assistance to renewable energy clients relating to leasing and access for power generation and transmission on private, state and split-estate lands. Counsel to LS Power in connection with PRC and legislative issues involving rights of first refusal. Lead counsel to Freeport McMoRan Copper & Gold and its predecessor, Phelps Dodge Corporation, in a complex land transaction involving the posting of fifteen large ranch holdings of Pacific Western Land Company as collateral to the State of New Mexico Mining and Minerals Division (MMD) and Environment Department (NMED). Elements of the representation included the overseeing of title reviews, mortgage drafting, land appraisals and Phase I, II and III environmental reviews and transactional screens, all within the regulatory framework of providing financial assurance for closure of large open pit copper mines under the New Mexico Mining Act. Lead counsel to the owner of a large tract of highly developable “bosque” lands in Albuquerque’s North Valley upon which the owner placed a permanent conservation easement for the benefit of current and future generations of the public. When the State subsequently rejected an appraisal of the conservation easement, a successful appeal resulted in the Court’s reversal of the Taxation and Revenue Department for its “arbitrary and capricious” action. See John and Cynthia Sparks v. New Mexico Taxation and Revenue Dept., et al., Second Judicial Dist. Ct. (NM) Civil Action No. CV-2010-07137. Lead litigation counsel for two Elkins family ranches against a lessee that sued in State District Court to avoid requirements under a consolidated mining lease and access agreement involving the two ranches. The court dismissed all claims against the Elkins on a motion to dismiss for failure to state any claim upon which relief may be granted. See Ree-Co Uranium L.P. and Oliver Reese v. Lynn Elkins, et al., Eleventh Judicial Dist. Ct. (NM) Civil Action No. D-1113-CV-200900584. Lead counsel for J.H. Williams, and subsequently his estate and siblings, in negotiating and drafting a uranium lease and option with a prospective developer, and in subsequently representing their interests against a “traditional cultural property” designation encompassing their mineral interests and associated express and implied surface rights. Transactional and litigation counsel to the Ramirez family, owners of a tract within the boundaries of the Manzano Land Grant community believed to be the locus of a 17th Century Spanish industrial mining complex. In addition to achieving a favorable settlement of state court claims made against the family by an early interested party, negotiated and drafted three significant transactional vehicles, including an exploration with option agreement, a mining lease, and a joint venture relating to intellectual property and archeological resources. Counsel to Santa Fe Pacific Gold Corporation, its predecessor, Santa Fe Pacific Mining, and its subsidiary, Cerrillos Land Company, in negotiating and drafting over twenty joint venture agreements based loosely on the Form 5 Model Mining Joint Venture Agreement published by the Rocky Mountain Mineral Law Foundation (RMMLF). The mineral lands involved in the ventures were part of the millions of acres of checkerboard lands granted from the United States to the Santa Fe Railroad throughout the West.